Inside the house of the future Jump to media player It's hoped that in the future, robots in the home might be able to care for those who need it, like the elderly or those with a disability. How to make a straw house Jump to media player Professor Peter Walker from the University of Bath, teaches Ayshah the secrets behind making a house out of straw. Time-lapse of Y:Cube housing build Jump to media player A time-lapse video shows how the YMCA's new affordable housing scheme, the Y:Cube in south-west London, can be moved around and stacked. What will the house of the future look like? As Britain struggles to solve its housing shortage crisis, experts have been looking at the best solutions to building new homes. 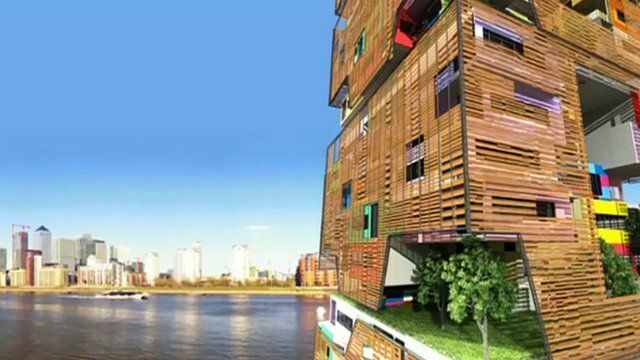 Professor Philip Oldfield and the Sustainable Tall Buildings Design Lab at the University of Nottingham have been trying to predict what new houses will look like in 2050. A specially-commissioned animated film for BBC Inside Out shows a variety of approaches to how our homes might look in 40 years' time. The homes of tomorrow could range from sky-high apartments in vertical villages to flat-pack, pre-fabricated housing and eco homes. Inside Out is broadcast on BBC One on Monday, 21 September at 19:30 BST and nationwide for 30 days thereafter on the iPlayer.